Improving your average speed, it’s the holy grail for cyclists, here are 10 tips on how to achieve it. The feeling of speeding along on your bike is like no other, but there can come a point when you struggle to get any faster. The good news is that it’s not all about fitness, although that helps too! 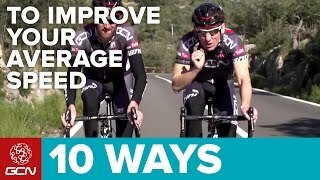 In this video, Matt and Dan talk through 10 things that you can try out, to help you increase the speed of your rides. We’d love to know how you get on, let us know in the comments section below.